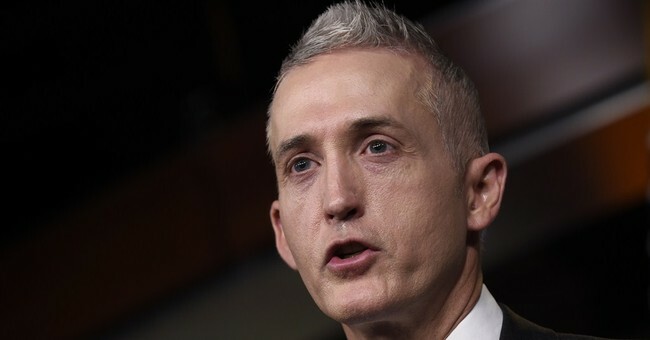 Trey Gowdy Destroys FBI's Peter Strzok: Why Did You Talk About Impeaching Trump a Day After the Special Counsel Launched? In typical fashion Thursday, House Oversight Committee Chairman Trey Gowdy did not mince words while questioning embattled FBI agent Peter Strzok during a joint hearing with the House Judiciary Committee. First, Gowdy slammed Strzok during his opening statement and defined him as a biased, selfish agent out for vengeance. Then when Strzok refused to answer questions, Gowdy went after him again and destroyed him with evidence...written by Strzok himself. This is the second time Strzok has testified in front of the Committees. The first time came last week and was held behind closed doors. Strzok's mistress, FBI lawyer Lisa Page, will testify in a closed session tomorrow after refusing to comply with a congressional subpoena earlier this week. She is also expected to testify at a pubic hearing in the near future.